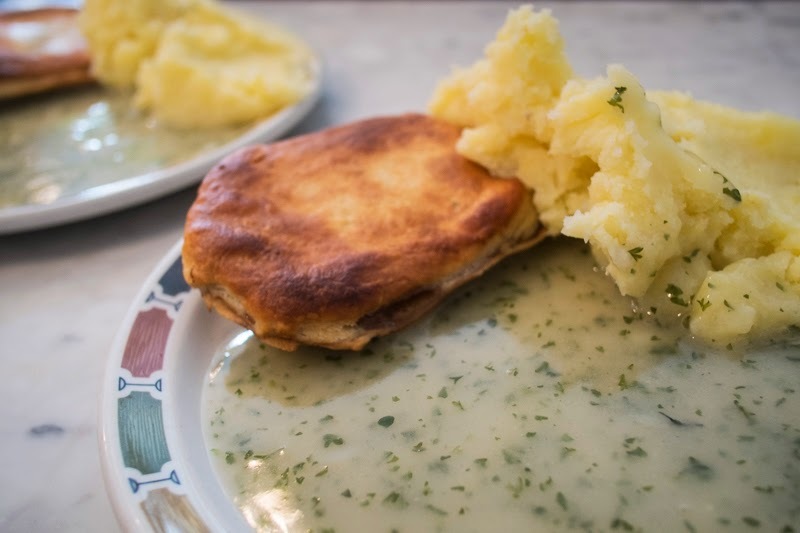 … it must have been all of the liquor that did it or maybe it was the mash .. or perhaps it was just a bit too much of everything on my first outing to a genuine and disappearing London institution, an eel, pie and mash house. Originally sold from carts in alley ways, eel pies were very popular among working class East End Londoners as far back as the early 1800’s. When the Thames then got too polluted to support any fish life (the eels were the last to go) eels were imported from Holland and barged up the Thames to eager Londoners . The very civilised Victorians brought eel pies indoors and added mashed potato and a “liquor” (made to a secret recipe from the eel cooking water with parsley that even today the various house owners guard closely …) to make it all a sit down meal on a plate, cheap enough for the masses to enjoy as the “poor man’s delicacy” - good old thoughtful Victorians. In addition to the lovely eel pies you could complete your feast with the addition of hot stewed eels or cold jellied eels. Salt, pepper, and vinegar were the only condiments needed. After WWII the pie filling changed to beef mince. However, the stewed and jellied eels still remained firm favourites, and menu stalwarts. 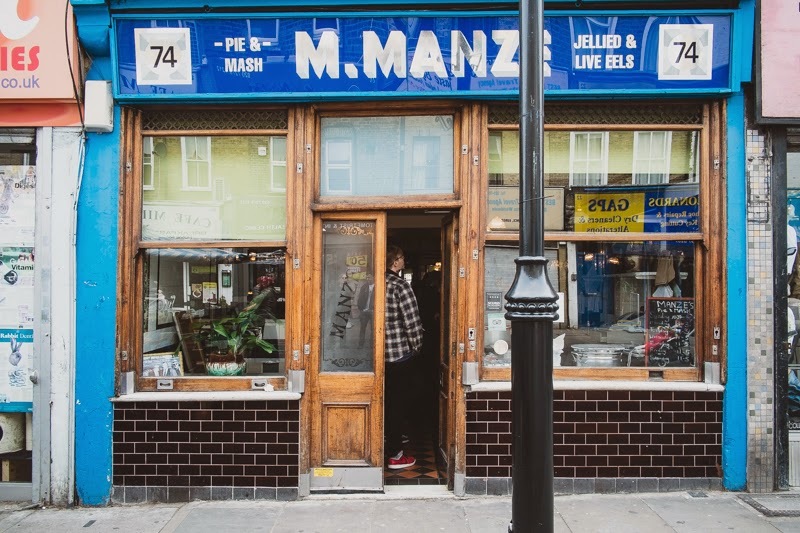 With the Doll in tow and a visitor from Scotland who shall remain nameless (Dougie) we headed to M Manze in Islington to try out these timeless classics. The eel, pie and mash houses that I have gazed into on my travels around London all have the classic tiled walls that the Victorians were so fond of in their eating establishments - easy to clean, while being decorative I imagine - good old practical Victorians. I ordered for all three of us - 3 small pies, mash and liquor, and the owner didn’t bat an eyelid as he said "ok 3 pies for you, what are the others having?" So once seated with 3 separate orders of one pie, mash, and liquor each and a side order of jellied eels, we set about our mission with gusto. The pies and mash with the eel liquor were quite surprisingly (to me anyway) more than edible. 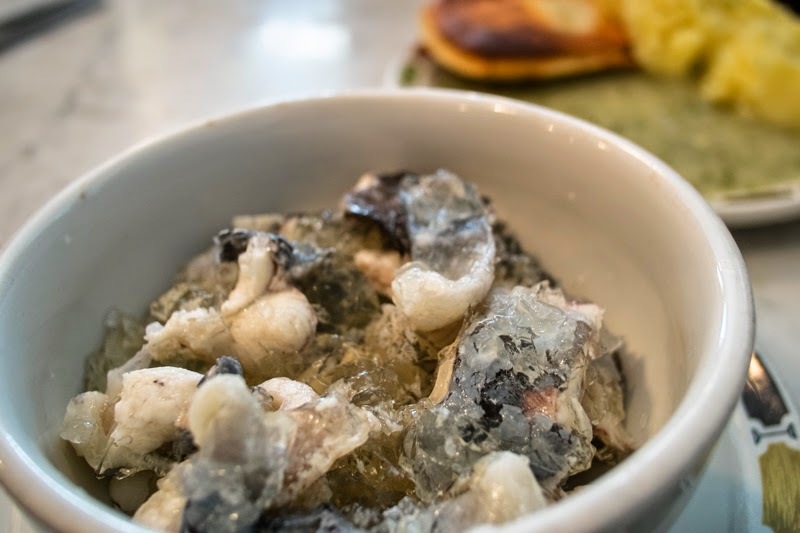 I am afraid we all lacked the bravery to do much damage to the extra generous portion of jellied eel we had been served ... there was just something about the jelly that my mouth didn't like. There is even a club that meet monthly for lunch at one of these venerable institutions, a different one each month - want to join them? .. then just send a piemail to the Pie & Mash Club. I passed many of these when first in London but they appeared to have died out, possibly because real food is available! Oh Ted, you are a brave soul when it comes to culinary quests. I think I might have to have been absent for this one. I have to admit... I'd sit this one out! I could have finished off those jellied eels for you, the doll & the other bloke! I remember eels being sold when I was growing, I've always preferred the pies! An eel pie? Eeeeeeewww. Sorry, Ted and Mo. I stopped reading . . . . .